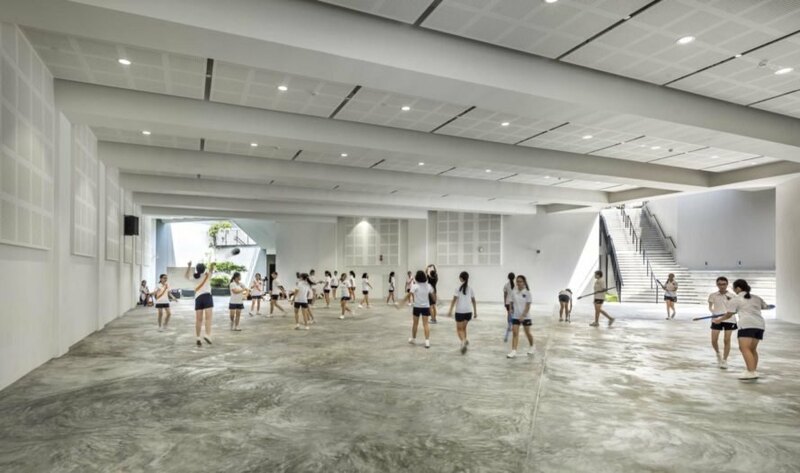 When Singaporean architecture firm Park + Associates was tapped to design an extension for Nanyang Girls’ High School in Singapore, the team knew that it would have to think creatively. The brief called for two large four-story blocks that would house a variety of programs, including classrooms, a large performing arts center and a multipurpose indoor sports hall. 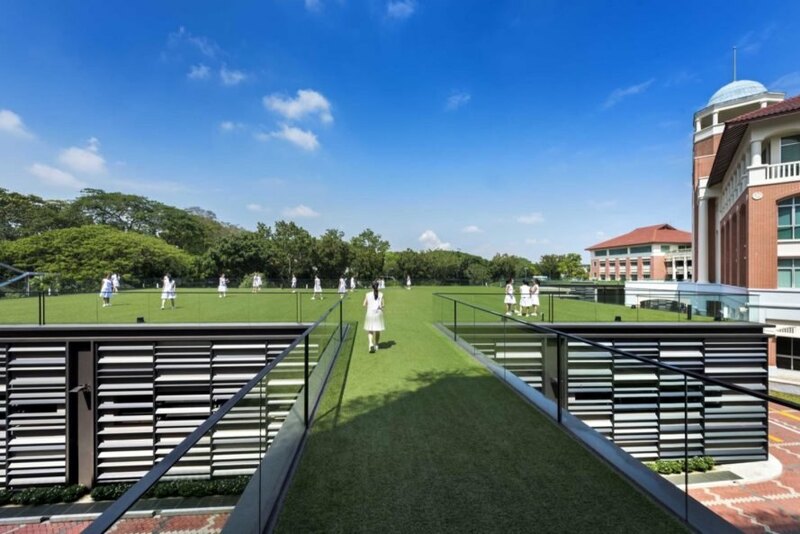 To meet these requirements without overshadowing the school’s existing architecture, the firm built the spaces below ground — an unconventional move and considered the first of its kind for an academic extension in Singapore — and topped the new buildings with artificial turf that can be used for sports and outdoor recreation. Founded in 1917, the Nanyang Girls’ High School is one of the top public schools in Singapore. 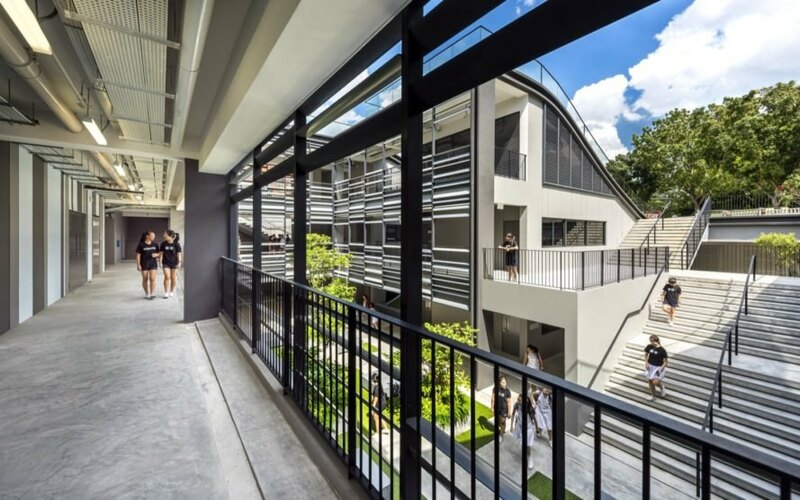 The school changed campuses several times and has been established at its present location along Dunearn and Bukit Timah Roads in the heart of Singapore since 1999. The school’s original colonial-inspired architecture comprises a clock tower flanked by two brick wings and has become an iconic landmark for the area. 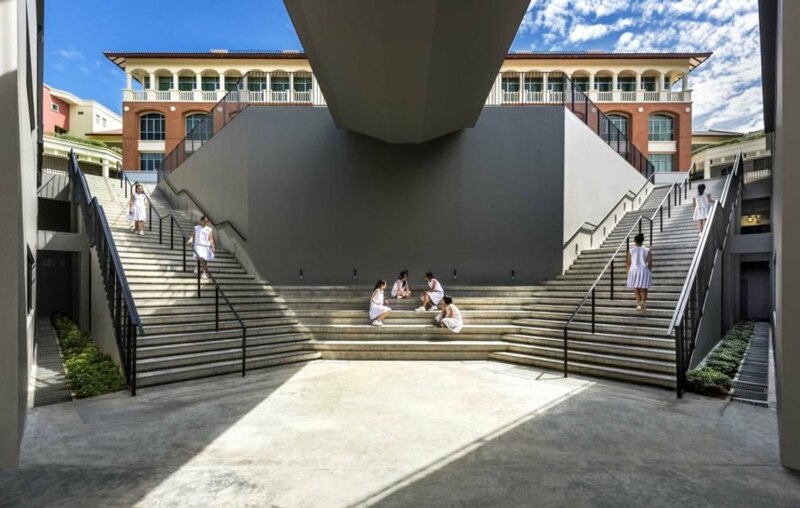 As a result, Park + Associates wanted to preserve the appearance of the building without necessarily emulating the existing school complex in the new design. Therefore, the firm decided to set the two new extension blocks partly below ground and top the volumes with curved green roofs that slope to touch the ground. 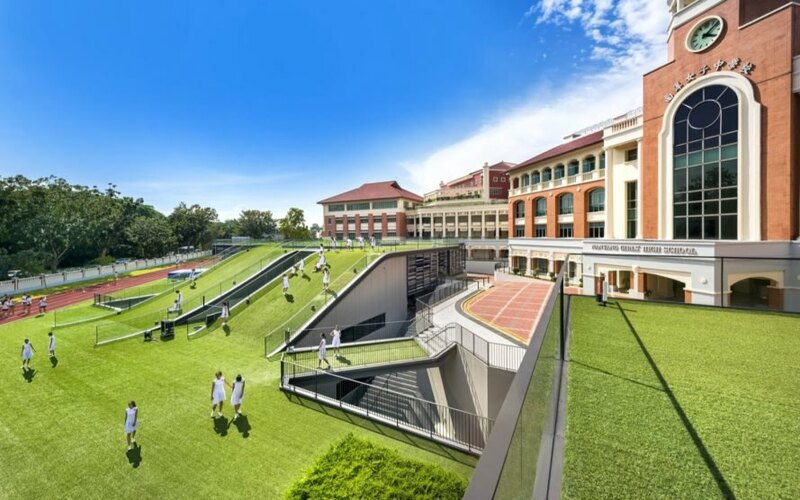 By lining the roofs with artificial turf, the architects could also replace the school field. Careful consideration was taken to create bright and airy interior spaces within the partially underground extension, which enjoys access to plenty of natural light, views and natural ventilation. 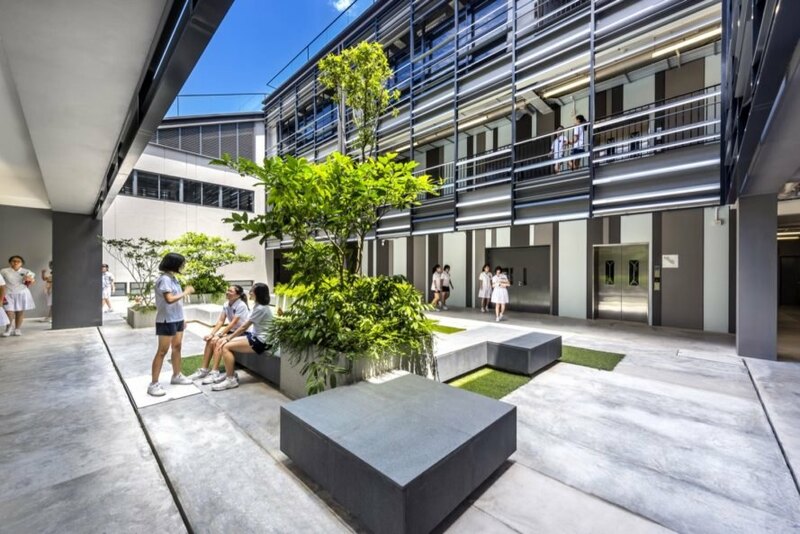 Park + Associates complemented the traditional architecture at Nanyang Girls' High School with innovative underground buildings topped with turf. The added green space allows students more room for activities. The turfed areas can be used for outdoor recreation and sports. The new design created a mixture of above- and below-ground spaces for leisure, study and sports. The partially underground structures still benefit from natural light, ventilation and views. The extension allows students more room for socializing and studying. The project is innovative compared to typical school architecture. The school lies in the heart of Singapore. 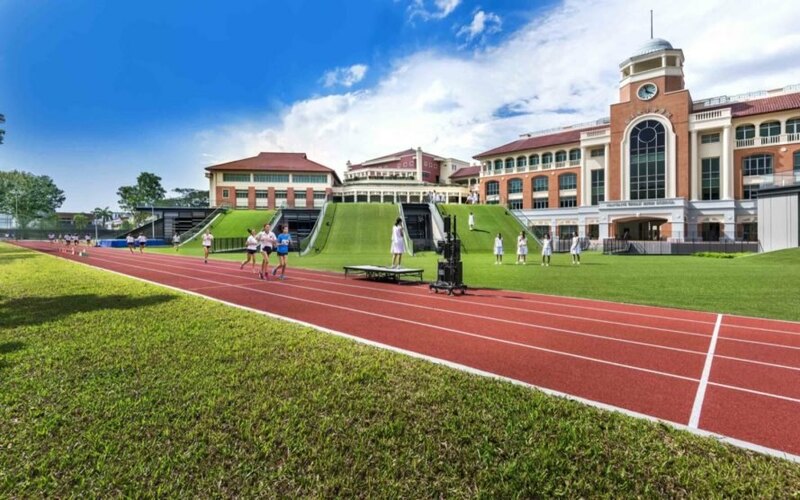 This high school is one of the top public schools in Singapore. The project involved both indoor and outdoor recreational areas. The students enjoy the latest updates to the school.